Let us be fair. 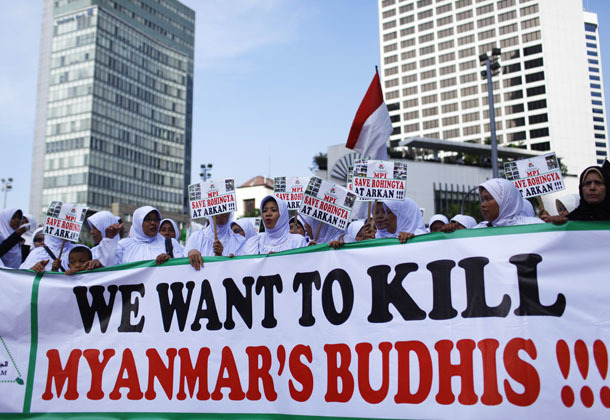 Let us assume that Myanmar is a Muslim country and the Rohingya are Buddhists. Then the Buddhist refugees insisted that they are citizens and wanted to take a region from the Muslim Myanmar. When their claims were rejected by the Muslim Myanmar the Buddhist Rohingya accused them of injustice and human rights abuses and took up arms against the Muslim Myanmar and violence erupted resulting on deaths from both sides. Who is to blame? The Buddhist Rohingya or the Muslim Myanmar? What the Muslims in the world will feel and do towards the Buddhist refugees’ insurgency against the Muslims of Myanmar? Will the Muslim sheikhs take up arms and engage in violence to protect their land, people, and faith? Will the Muslims declare Jihad to fight against Buddhist militants? Stop the hypocrisy; this crisis is not about Islam versus Buddhism; or about wicked Buddhist monks. It is simply about protecting Myanmar from refugees and terrorists with foreign support hiding behind civilians and using them and using Islam as shields. There is no reason whatsoever to condemn Buddhist monks for carrying arms and engaged in legitimate defensive violence. The matter is about defending their land, people, and faith. This is a normal and must be encouraged and not condemned. The defamation of armed Buddhist monks must not apply to any religion equally. No one could assume that good Buddhist monks must sit down and do nothing while refugees and insurgents attack their land, people, and faith. The only solution for the Rohingya- Myanmar problem is by creating a mandatory global fund with contributions from all who colonized, enslaved, and exploited the Bengal. The fund shall be used to develop Bangladesh and enable it to accept and resettle the Rohingya refugees of Myanmar in Bangladesh and to fight the insurgent groups in Myanmar and protect the borders between the two countries. All who created the mess and misery of Bangladesh must be forced to pay. All countries must stop using the crisis for political gains and promoting terrorism and religious extremism. The generosity of Myanmar for hosting the refugees for such very long time must be appreciated, recognized, and compensated. It will foil their plans of exporting terrorism and exploiting this already impoverished region. Thank you for this article. It is a shame the majority of people are missing the big picture and reality of the situation. Myanmar media and citizens must do better to inform the world.